Heat oil in a small skillet over medium heat; cook and stir onion and green pepper until tender, about 5 minutes. Place tortillas on an ungreased baking sheet. 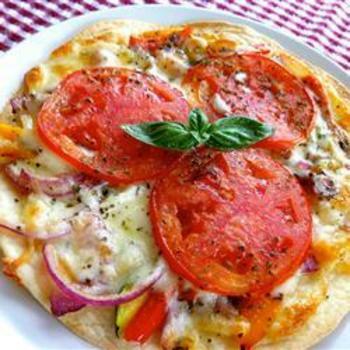 Top with onion mixture, oregano, garlic powder, tomato, and mozzarella cheese. Bake in preheated oven until cheese is melted, 8 to 10 minutes. Cut each pizza into four wedges.